German chocolate coffee creamer! have your cake and drink it too! Are you one of those people that likes coffee with dessert? I definitely am. Not always, but on weekends OR at fancy dinners, I love having a hot cup of coffee with rich desserts. In a small pot over low-medium heat, stir together the cocoa powder, agave nectar, water, and salt until the cocoa is dissolved into the water and agave. Once the mixture is smooth, stir in the cream, milk, coconut, and pecans and heat over low until the mixture is warm and bubbles are beginning to form around the edge of the pan. 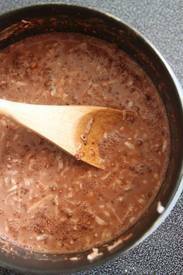 Remove the pan from heat and strain the milk, removing the pecans and coconut. Let the creamer cool for 10-15 minutes before pouring into an air-tight container. Cool and store in the refrigerator.